ome movies sweeps us off our feet… It feels so real and relatable. It steals our hearts and leaves a lasting impression in our hearts and minds of course! 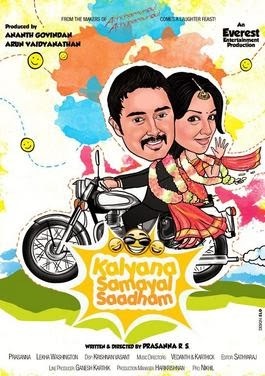 Kalyana Samayal Saadham written and directed by RS Prasanna is one such film. It is close to 2 hours and leaves a smile in your lips. The story is about how love is arranged between Raghu (Prasanna) and Meera (Lekha Washington) by their parents through the age-old arranged marriage. Their profiles are matched by their parents and birth-charts are matched by the astrologer. Raghu meets Meera and that’s it! He falls in love with her! A few minutes chat over coffee and Raghu’s insightful research about Meera by going through her Facebook profile follows. After a stressful confusion from the part of Meera on whether to marry him, they get engaged. Marriage being eight months away, they get time to know each other. They become friends first and then they fall in love! When lust takes over, they realize that Raghu has erectile dysfunction. And thus the movie goes to another level. Whether Raghu is cured… Does Meera stand by him…? Do they marry each other… forms the rest of the story. The plot handled by the director is sensitive and he has handled it delicately. There is not a scene where we flinch as an audience. It is aesthetically handled and humorously portrayed. It clearly puts across the familial stress that the bride and groom go through and how that affects them both mentally and physically. Prasanna and Lekha have done a brilliant performance. They are cute together and the ease with which they enact makes it more real and relatable. Thee characterization of their respective parents and his friends is nothing short of realism. That is exactly how a typical Tamil Brahmin family reacts, regardless of how progressive they are! And the friends, they are just awesome. The background score is brilliant and blends with the situations. Mella Sirithaai and Modern Kalyanam is my favorite. Kudos to ! The movie was released on 6th December 2013. And I feel sad to tell that it was not released in Kerala or Karnataka. I didn’t even know that it was released until a colleague said that it is already there online. After all, I was desperately waiting to watch the movie after seeing its trailer. I really wish that they promoted it more. If they did, it would have been an overall blockbuster! In short, the movie is progressive. It showcases the mindsets of yesterday’s (parent’s) and today’s (children’s) take on marriage and relationships. It also shows how it is changing radically and how they are gelling together. I enjoyed the characterization of Delhi Ganesh, who acts as Meera’s father. He is cool. So is Kathadi Ramamurthy as Raghu’s grandfather. This movie effortlessly bridges the gap between parents and children with big-fat arranged marriage as the backdrop. I loved the movie… its treatment… performances… music and also the dialogs so much that I am going for 4 out of 5 stars. It is a must watch! I agree with you but 4 out of 5? no doubt director has handled a delicate issue like ED, really well in the movie. and no doubt mella sirithai was honey to ears but rest of the songs so so.. but I think somewhere the movie got a bit carried away with the same issue.. I believe director/script failed to capture the tensions, excitements, anxiety, curiosity, desperateness etc both the guy and girl go through before marriage (especially in arranged marriages)..
another point I loved that the movie had put across is that its easy to become a husband but its difficult to become a friend of her's. two thumbs up for that. :) However, the final act by Prasanna to win Lekha's heart (friendship) didn't quite seem to fit the bill.. I totally agree with you Kannappa. And I was entertained and didn't feel bored for a second. And this seemed to be a genuine and new way of handling and tackling relationships. So i really believe it is worth 4/5. It loses that one extra star because as you rightly mentioned it gets carried away by the same issue! I confirm your doubt. There are enough movies where women whine and are portrayed as victims. They are projected as dumb-heads and shamefully, 90% of women in reality are strong. This movie throws light on that aspect. It concentrates on charactrisation than situations, i believe. Views differ... And yes... Everybody whine... It becomes annoying women are typecast!